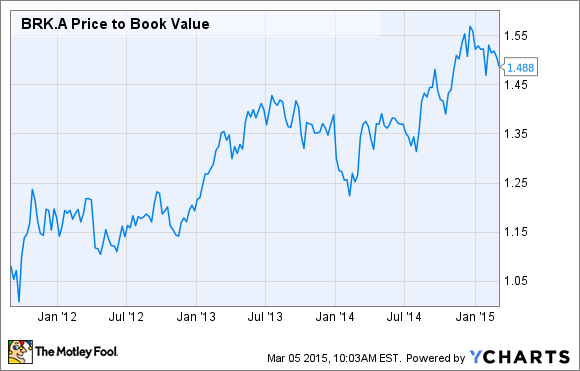 Over the past two years, Berkshire's share price has grown more than twice as fast as its book value. Have shares gotten a little pricey? 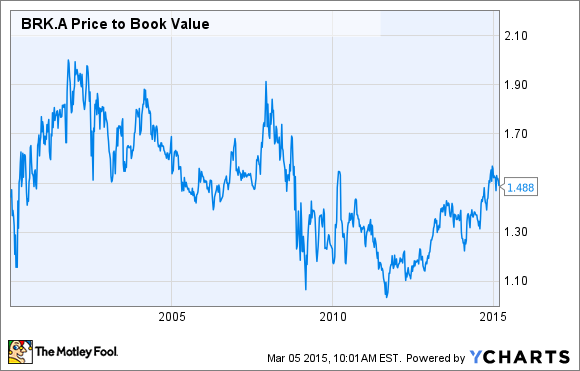 Last year, Berkshire Hathaway (NYSE:BRK-A) (NYSE:BRK-B) grew its book value by 8.3% following a nice 18.2% gain in 2013. However, the company's stock price rose by 32.7% and 27% in 2013 and 2014, respectively. In other words, Berkshire has grown much more expensive relative to its book value, leading its price-to-book ratio to increase steadily to nearly 1.5 today. What could be the reasons for this? Is Berkshire's stock simply keeping pace with the changing valuations in the overall market, or is it becoming disproportionately expensive? Is it still a good buy at its current valuation? Many investors know that Berkshire Hathaway is Warren Buffett's company, but many people aren't aware of what the company actually does. Berkshire's primary business is insurance, which it conducts through several subsidiaries, including GEICO. It then uses the premiums generated to invest, and the company's investment portfolio is nothing short of spectacular. Berkshire owns an impressive assortment of subsidiary companies that it has acquired over the years, including The Pampered Chef, NetJets, Hanes, and Duracell, just to name a few. The company has a stock portfolio that any long-term investor would love to have, including the stocks of 45 rock-solid companies. It is for these reasons, as well as for Berkshire's rock-star management team, that I recently called Berkshire the best all-around stock in the market. Berkshire has gotten more expensive -- so what? Berkshire's P/B ratio means shares are commanding a 50% premium to the value of the underlying assets, though this wasn't the case just a few years ago. However, when you look further into the history of Berkshire's valuation, it's clear that the current share price really isn't terribly expensive. For much of the time period between 2000 and the onset of the financial crisis, Berkshire traded in a range of between 1.4 and two times book value, so the current level is actually at the lower end of the historical range. In the most recent shareholder letter, Buffett cautioned against buying Berkshire when the P/B gets high, but he defined this as when the shares approach two times their book value. And as you can clearly see from the chart above, both times the valuation approached that level (2002 and 2007), a significant correction did indeed take place. However, at the present time we're still a long way off from what Buffett himself would refer to as a "high" valuation. But what is the rest of the market doing? Actually, when compared to the S&P, Berkshire looks even cheaper. Currently, the P/B ratio of the S&P 500 is 2.85, and it has risen just as fast as Berkshire's in recent years. Whereas Berkshire's valuation relative to book value has climbed 50% since 2011, the S&P's has climbed from about 1.9 to 2.85 during the same time period -- also a 50% rise. Berkshire has gotten more expensive, but when you consider the performance of the market as a whole, the increased valuation is completely justified. If anything, I think Berkshire is even more attractive now, as it seems its valuation should rise faster than the market in good times, given its history as an excellent defensive play. In his recent letter to shareholders, Warren Buffett made it clear that investors who buy Berkshire at high price-to-book multiples might not realize a significant profit for several years. In the past, Berkshire's share price has fallen significantly -- and will probably do so again -- we just don't know when. The point is that investors shouldn't try to time Berkshire or think of it in terms of short-term gains. Berkshire may (and has) underperformed the market from time to time, but over any economic cycle, the stock should do very well compared to the market, regardless of when you buy. Having said that, of course it's better to buy low, so if you invest in Berkshire, it may be a good idea to buy some now and keep some cash on the sidelines in case you get a better opportunity in the future.